Few models produced in the 1960's survived the demise of Hamilton's US production in 1969. There are a few though that did, and even flourished. One of them is the 1968 Accumatic A-203, or just the A-203 as it would be known as in the 1970's. It was produced well into the 1970's. Part of the allure of the A-203 is it comes in a 14K solid yellow gold case. It's one-piece case design enables it to be waterproof as long as the gasket in the crown is good. As a general rule, it's best to keep waterproof watches away from the water unless they've been recently tested and certified as "water proof"... otherwise if you get water in them, you'll be in trouble for sure. Tucked inside the original A-203 is a Swiss-made, 17 jewel Hamilton 689A. This ETA-based movement was commonly used but the model will likely have other movements after 1970, as the ETA-2451 that made up the 689 and 689A was also used in the 63 and 63A. Slight changes to shock jeweling and the balance are usually the differences between grades. I recently was asked to help someone who had dropped a family-owned A-203 of great sentimental value. Since I hadn't showed one on the blog, it was a good opportunity to kill two birds with one stone... keep the blog going and also help someone out. 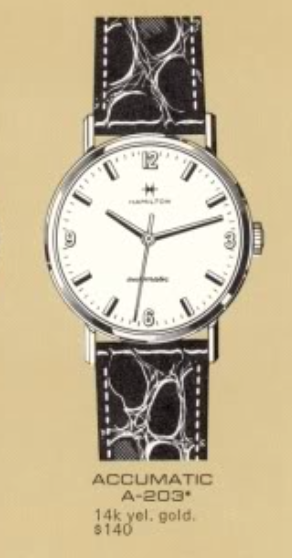 As received, the watch was missing it's crown... that means it was also missing the male portion of the two-piece stem. The crystal looked okay from the front - but it's actually extensively cracked on the edges. The back of the case is in nice shape. The watch appears to have been well taken care of. Here's a shot of the crystal and the cracks along the perimeter. The 689A is a pretty straightforward movement. As long as it's properly maintained (and lubricated) it will last a lifetime. While the parts are being cleaned, I'll prep a new crystal for installation. The A-203 takes the largest crystal I have used to date at just under 31mm... 30.9 to be precise. I had to get a special waterproof crown for the watch. There's a lot that goes into picking a crown, believe it or not. The diameter of the crown head, the tap of the threads, and in this case, the length of the tube. Many times the tube is flush with the crown but I needed the longest one I could get so that the male stem would be able to reach the female side tucked well within the case. Everything is cleaned and ready to be reassembled with fresh lubrication. A few twists of the new crown brings the movement to life and there's absolutely nothing to complain about this watch's performance. And here's the finished project, all polished up and ready to go home in a couple of days, after I can make sure the hands move as they should and the time keeping is as expected. It's a nice looking watch and it really turned out well.